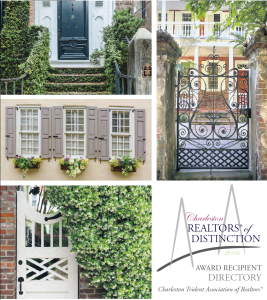 The REALTORS® of Distinction award recognizes the top 10% of producing Charleston REALTORS® with 1 or more transactions who apply for the award, complete additional education requirements in the award year, and adhere to the REALTOR® Code of Ethics. Award recipients will be recognized at a luncheon on March 19 from 11:30am-1:30pm at Trident Tech N. Campus. General Admission Tickets are $25 for Award Recipients and $35 for guests. Sponsor a Table of 8 for $350. You’ll receive 8 seats at a reserved table near the front of the room with your company logo. $7,900,000+ in volume and/or 22+ sides (80% of your transactions must be commercial). Members may apply for only one award category (Residential, Commercial, Rising Star, Property Manager, or Team). These may be CE courses, lunch and learns, office seminars, webinars, professional development presentations, and/or educational conferences, Code Pros, MLS classes, etc…All courses must be at least one hour. A team is 2 or more licensed producing sales associates who combine sales for award or commission sharing in any fashion. Independent contractors employed by a team in non-selling/non-listing activities are not counted as a member of the team. A team may apply as a team OR as individuals, but not both. If a team chooses to apply as individuals the team production is divided by the number on the team and that is the number each member may claim. Or, we will use the amount shown on the Flex Residential Sales Report under each individual team member’s name as of Dec. 31, 2018. Individual Residential Award applicants MUST use the Flex Residential Sales Production Report plus a list of any additional transactions not under your name in MLS, not under your partner’s name, or not in MLS. If a list of additional transactions is not included with your application, only those transactions under your name in the Flex Residential Sales Production report will count. Check this report for accuracy after each closing within 5 days; do not wait until year end. Incomplete or inaccurate applications risk being rejected. Individuals or teams falsifying their production numbers or # of people contributing to their volume/units or their education hours will be charged with a violation of the Code of Ethics. Congratulations to the 2017 Realtors of Distinction! Check out photos from the event here and the ad that ran in the Post and Courier here. View and download the full PDF below.